Despite their name Australian honeyeaters don’t actually eat honey (although they probably wouldn’t reject it if offered!). This large and diverse group of birds has developed a range of feeding strategies, but the feature they have in common is a brush-tipped tongue, ideal for collecting nectar from blossoms and sugary insect secretions called honeydew. However, for some honeyeaters, insects – an essential source of protein – and fruit form a significant part of their diet. 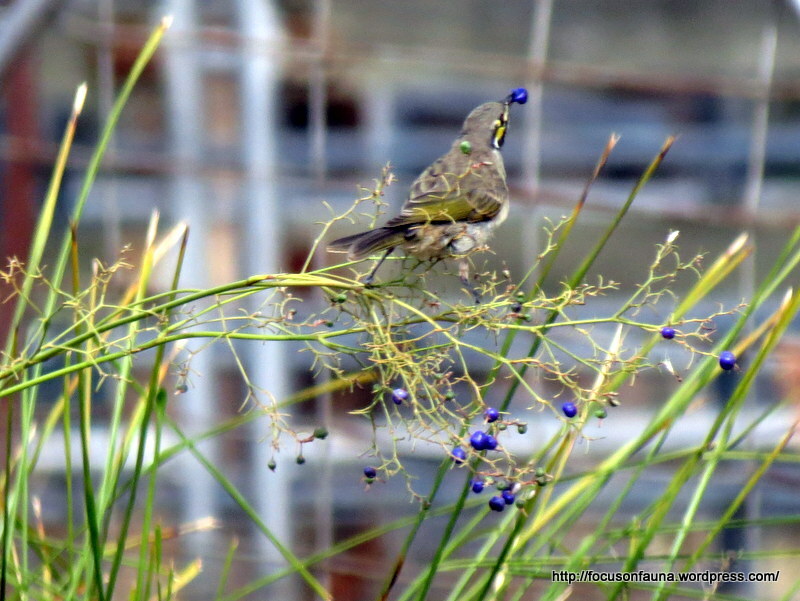 One of these is the Yellow-faced Honeyeater (seen in the photo above), a common bird of this district – and the succulent blue/purple berries of native flax-lilies (Dianella spp.) provide a ready food source at this time of year. Flax-lilies can still be found on undisturbed local roadsides, but we won’t attempt to name the species shown in the picture because classification of the genus Dianella is under revision at present. The Yellow-faced Honeyeater clings onto the flax-lily’s stem as it droops under the bird’s weight, and picks off the berries one by one. But we have seen a different technique used by a magpie – it kept leaping from the ground in an attempt to seize the berries – sometimes successfully and often not!